Desmoid tumors are slow growing deep fibromatoses with aggressive infiltration of adjacent tissue but without any metastatic potential. We report on two female patients with desmoid tumor of the abdominal wall who underwent primary resection. Both patients had a history of an earlier abdominal surgery. Preoperative evaluation included abdominal ultrasound, magnetic resonance imaging and computed tomography. The histology in both cases revealed a desmoid tumor. Complete surgical resection is the first line management of this tumor entity. Desmoid tumors are benign myofibroblastic neoplasms originating from the muscle aponeurosis and classified as deep fibromatoses . They constitute 3% of all soft tissue tumors and 0.03% of all neoplasms . Despite their aggressive local infiltration, desmoid tumors lack a metastatic potential . However, because of this local infiltration and compression of surrounding structures, a high recurrence rate exists and in anatomic locations with restricted access to surgical resection desmoid tumors can lead to death . Especially in patients with familial adenomatous polyposis (FAP) undergoing colectomy desmoid tumors are the leading cause of morbidity and mortality . Molecular studies demonstrated desmoid tumors in FAP as clonal neoplasms arising from germline mutation or changes in the APC alleles [6–8]. Cytogenic data verified clonal chromosome aberrations in deep-seated sporadic extra-abdominal fibromatoses and lesions of the abdominal wall and therefore provide additional evidence for the neoplastic nature of these lesions . Main locations of desmoid tumor occurrence are the proximal extremities, the abdominal wall and the mesenteric intestine in patients with FAP . In sporadic cases, they occur in localisations of trauma, and scars or irradiation. The therapeutic management of these tumors is still controversial. A 28-year-old female recognized a left lower abdominal wall tumor. In her history she reported an appendectomy and two pregnancies with spontaneous birth in 1994 and 1999. On clinical admission, a painless tumor was investigated without any contact to hip bone structures. Analysed blood parameters were within normal range and tumor markers were negative. Preoperative computed tomography scan (CT, figure 1) and magnet-resonance-tomography (MRT, figure 2) revealed a left lower abdominal wall tumor of unknown dignity. The MRT morphology demonstrated a fibrotic tumor, originating from the transversal and internal oblique abdominal muscle fascia. The resection of the tumor with excision of the oblique internal abdominal muscle followed and the defect was covered with a Bard Composix-Mesh® (C. R. Bard, Inc., 730 Central Aves Murray Hill, New Jersey, 07974, USA) and major omentum. CT Scan with contrast enhancement demonstrates the desmoid tumor originating from the abdominal transversal and internal oblique muscle fascia with inhomogeneous formation (arrow bar). 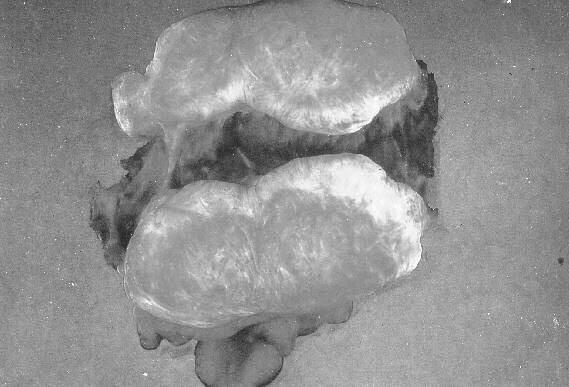 MRT shows the tumor's location embedded in the adjacent musculature. The hypointense parts of the tumor indicate the high mucoid proportion (arrow bar). The postoperative course was uneventful and the patient was discharged at the 8th postoperative day. 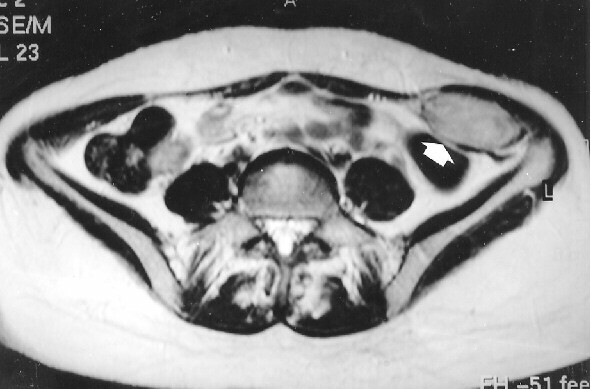 A 37-year-old female recognized an initially painless tumor in the right lower abdominal wall. In her history, the patient reported on a laparoscopic resection of an ovarian-cyst in 1993 and two pregnancies (1995 and 1997) with caesarean section. On admission, a palpable demarcated fixed tumor in the right lower third of the lateral abdominal wall was investigated. Analysed blood parameters were within normal range and tumor markers negative. 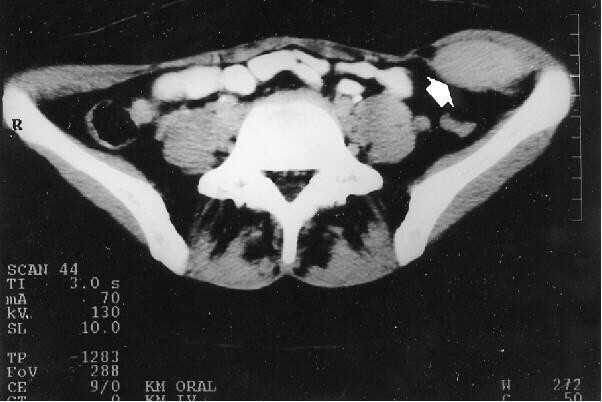 The CT revealed an ovarian-tumor, combined with a right abdominal wall tumor of unknown dignity. A metastasis of the ovarian-tumor, a lymphoma or a sarcoma was discussed as differential diagnosis. The MRT demonstrated the abdominal wall tumor originating from the abdominal transversal muscle and internal abdominal oblique muscle fascia. First, extirpation of the right ovary was performed. The resection of the abdominal wall tumor included the excision of the internal abdominal oblique muscle, replaced by a Bard Composix-Mesh® and covered with major omentum. The postoperative course was uneventful and the patient was discharged at the 9th postoperative day. Microscopic examination of the resected specimen in both the cases revealed the spindle-cellular tumors immigrated through muscle-tissues consisting of partially intact musclefibers surrounded by spindle like elements. Tumor-cells had a pale eosinophilic cytoplasm and chromatin structures and were embedded in collagen network interrupted by fibrotic sections (Figure 3). 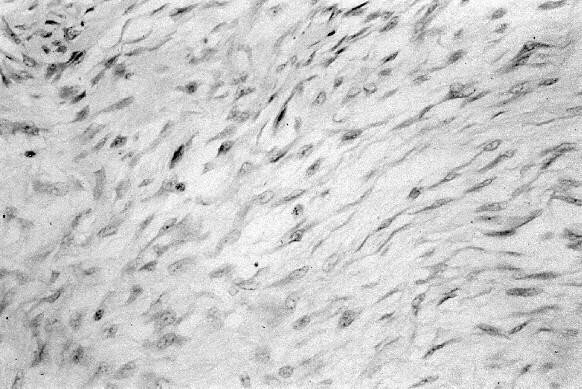 The immunohistochemistry revealed a minority of spindled tumor cells, expressing smooth muscle cell actin. Lower than 3% of the tumor-cells expressed the proliferative Ki 67 antigen. A desmoid tumor was diagnosed in both cases (figure 4). Layers of tumor cells with pale eosinophilic cytoplasm and nuclei and sporadic mitoses characterize the histological picture. The desmoid tumor is macroscopically composed of a well-defined capsule infiltrated by a collagen network with fibrotic sections. Sections from the ovary in case 2 revealed a demarcated, non capsulated, spindle-cellular, collagen rich tumor a diagnosis of an ovarian fibroma without signs of malignancy was made. Desmoid tumors are benign deep fibromatoses, originating from fascia and muscle aponeurosis with an infiltrating growth . They are primary located abdominally or intraabdominally , whereas only sporadic cases describe a localisation within the thorax wall  or retroperitoneally . The desmoid tumor is often associated with female gender, FAP  and occasionally with surgical trauma . It has a higher prevalence in women who experienced pregnancy . Depending on the tumors size, on the therapy and on the negative resection margins, recurrence occurs in up to 45% . CT scan localizes the tumor and excludes metastasis (figure 1). MRT reveals the tumor's hypointensity on T1 and demonstrates variable signal intensity on T2 weighted imaging, depending on the accumulation of mucoid structures (figure 2). Therefore, a differentiation from other solid tumors is impossible using morphological criteria . Histology is the only evidentiary method which demonstrates long fascicles of spindle cells of variable cell-density with few mitoses and absence of atypical nucleus-separations (figure 3). Characteristically, there is a diffuse cell infiltration of adjacent tissue structures. Immunohistochemical response for actin can be partially positive and immunohistochemical muscle cell markers delimit desmoid tumors from fibrosarcoma . The therapy of choice is still controversial . Anti-inflammatory treatment , hormone-therapy  and chemotherapy  were not shown to be effective. These therapies are limited to patients, in whom resection is technically impossible because of a widespread tumor infiltration. The effectiveness and indication of initial and adjuvant radiation is not proven yet. In a comparative analysis, a significantly better local recurrence control was described with radiation and combined surgical resection in comparison to resection only . However, these results of radiation therapy can only be achieved due to a higher complication rate . Other studies show a tumor progress after radiation therapy  and a high local recurrence rate . Due to the germline mutations and chromosomal aberrations of the APC alleles Bright-Thomas et al. performed a pre-clinical study of gene transfer for the treatment of desmoid disease in FAP . Despite the success of transgene expression, further work is needed in animal models of desmoid disease to assess the clinical effects of gene therapy. Therefore, the most effective treatment of accessible and smaller desmoid tumors is still the resection with negative margins, although it may not prevent local recurrence . However, massive mesenteric lesions often occur in FAP patients after colectomy  and non surgical treatment has variable and unpredictable objective efficacy [10, 21, 28, 29]. Middleton et al. reported on successful short-term surgery in four cases of large intra-abdominal tumors in which non-surgical treatment was inefficient . In conclusion, there remains a need for a wider range of therapeutic options, especially in the management of these massive tumors. Surgery always aims at radical tumor resection with free margins, which, depending on localisation of surgery, may leave major soft tissue defects behind [28, 30, 31]. 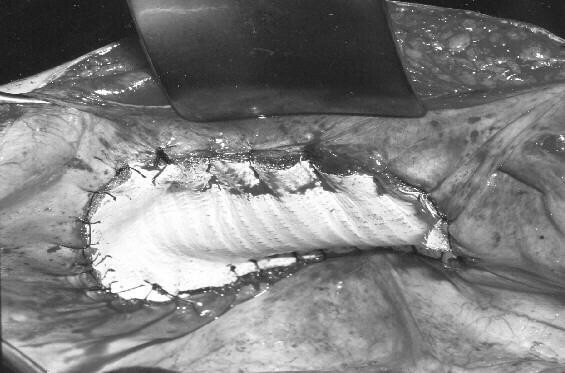 Although abdominal wall integrity after full-thickness surgery can be restored with direct sutures [4, 32], reconstruction with synthetic materials is a common technique in major abdominal wall defects . Albeit in our study the small tumor resection with tumor free margins and reconstruction of the abdominal wall was performed with a Bard Composix-Mesh® (figure 5), recent literature data recommend distant or free muscle flaps for greater abdominal wall defect coverage that is not accessible to local flaps [30, 32]. Additionally, prosthetic material is more susceptible to bacterial infection and other complications [34, 35], although new developed material showed encouraging experimental results . After resection of the desmoid tumor the abdominal wall defect is replaced with a Bard Composix-Mesh®. In conclusion, the treatment of desmoid tumors remains enigmatic. Non-surgical treatment resulted in diverse and unpredictable outcome and is considered to be an opportunity in patients with unresectable lesions or for adjuvant therapy. Radical resection with clear margins remains the principal determinant of outcome with the risk of local recurrence. MO participated in the preparation of the manuscript, literature search and drafted the manuscript. PD was responsible for the operations, follow-up of the patients and data preparation and conceived of the study. HPF carried out the tissue preparation, (immuno)histology and edited the manuscript for its scientific content. HJT accomplished and analysed the CT scans and MRT and approved the final version of the manuscript. AH participated in its design and coordination.